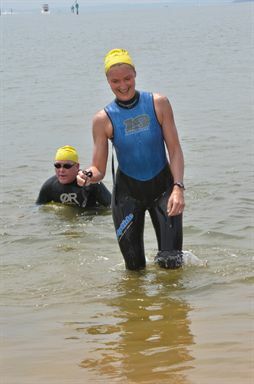 I foreshadowed this unbelievable finish-line photo in my Great Chesapeake Bay Swim race report yesterday. Still, I’m pretty sure you weren’t expecting *this. * My only consolation: Unlike the poor dude behind me, I was, in fact, able to stand up. That is amazing. Standing = impressive! Yippy… you finished !!! And look tired! your expression is priceless. you look thrilled to have finished! You’re smiling – just a wee bit tilted – like many of us after completing an ultra. I like it!